The word history comes from the root *weid- "know" or "see". Ancient Greek সাঁচ:LSJ means "inquiry" or "knowledge from inquiry", from সাঁচ:LSJ (hístōr) "judge" (from the Proto-Indo-European agent noun *wid-tor: "one who knows"). It was in that sense that Aristotle used the word in his Περὶ Τὰ Ζῷα Ἱστορίαι (Perì Tà Zôa Ηistoríai "Inquiries about Animals"). The ancestor word ἵστωρ is attested early on in Homeric Hymns, Heraclitus, the Athenian ephebes' oath, and in Boiotic inscriptions (in a legal sense, either "judge" or "witness", or similar). It was still in the Greek sense that Francis Bacon used the term in the late 16th century, when he wrote about "Natural History". For him, historia was "the knowledge of objects determined by space and time", that sort of knowledge provided by memory (while science was provided by reason, and poetry was provided by fantasy). The word entered the English language in 1390 with the meaning of "relation of incidents, story". In Middle English, the meaning was "story" in general. The restriction to the meaning "record of past events" arises in the late 15th century. In German, French, and most Germanic and Romance languages, the same word is still used to mean both "history" and "story". The adjective historical is attested from 1661, and historic from 1669. Historian in the sense of a "researcher of history" is attested from 1531. In all European languages, the substantive "history" is still used to mean both "what happened with men", and "the scholarly study of the happened", the latter sense sometimes distinguished with a capital letter, "History", or the word historiography. The study of history has sometimes been classified as part of the humanities and other times as part of the social sciences. It can also be seen as a bridge between those two broad areas, incorporating methodologies from both. Some individual historians strongly support one or the other classification. In the 20th century, French historian Fernand Braudel revolutionized the study of history, by using such outside disciplines as economics, anthropology, and geography in the study of global history. 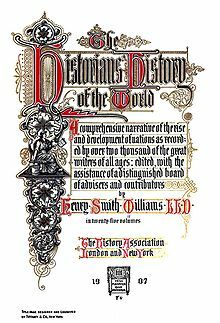 Traditionally, historians have recorded events of the past, either in writing or by passing on an oral tradition, and have attempted to answer historical questions through the study of written documents and oral accounts. For the beginning, historians have also used such sources as monuments, inscriptions, and pictures. In general, the sources of historical knowledge can be separated into three categories: what is written, what is said, and what is physically preserved, and historians often consult all three. But writing is the marker that separates history from what comes before. Archaeology is a discipline that is especially helpful in dealing with buried sites and objects, which, once unearthed, contribute to the study of history. But archaeology rarely stands alone. It uses narrative sources to complement its discoveries. However, archaeology is constituted by a range of methodologies and approaches which are independent from history; that is to say, archaeology does not "fill the gaps" within textual sources. Indeed, Historical Archaeology is a specific branch of archaeology, often contrasting its conclusions against those of contemporary textual sources. For example, Mark Leone, the excavator and interpreter of historical Annapolis, Maryland, USA has sought to understand the contradiction between textual documents and the material record, demonstrating the possession of slaves and the inequalities of wealth apparent via the study of the total historical environment, despite the ideology of "liberty" inherent in written documents at this time. ↑ 3.0 3.1 Professor Richard J. Evans (2001). "The Two Faces of E.H. Carr". History in Focus, Issue 2: What is History?. University of London. http://www.history.ac.uk/ihr/Focus/Whatishistory/evans10.html। আহৰণ কৰা হৈছে: 10 November 2008. ↑ Professor Alun Munslow (2001). "What History Is". History in Focus, Issue 2: What is History?. University of London. http://www.history.ac.uk/ihr/Focus/Whatishistory/munslow6.html। আহৰণ কৰা হৈছে: 10 November 2008. ↑ Peter N. Stearns, Peters Seixas, Sam Wineburg (eds. ), ed (2000). "Introduction". Knowing Teaching and Learning History, National and International Perspectives. প্ৰকাশক New York & London: New York University Press. পৃষ্ঠা. 6. ISBN 0-8147-8141-1. ↑ Nash l, Gary B. (2000). "The "Convergence" Paradigm in Studying Early American History in Schools". In Peter N. Stearns, Peters Seixas, Sam Wineburg (eds.). Knowing Teaching and Learning History, National and International Perspectives. প্ৰকাশক New York & London: New York University Press. পৃষ্ঠা. 102–115. ISBN 0-8147-8141-1. ↑ Seixas, Peter (2000). "Schweigen! die Kinder!". In Peter N. Stearns, Peters Seixas, Sam Wineburg (eds.). Knowing Teaching and Learning History, National and International Perspectives. প্ৰকাশক New York & London: New York University Press. পৃষ্ঠা. 24. ISBN 0-8147-8141-1. ↑ Lowenthal, David (2000). "Dilemmas and Delights of Learning History". In Peter N. Stearns, Peters Seixas, Sam Wineburg (eds.). Knowing Teaching and Learning History, National and International Perspectives. প্ৰকাশক New York & London: New York University Press. পৃষ্ঠা. 63. ISBN 0-8147-8141-1. ↑ "Online Etymology Dictionary". Etymonline.com. http://www.etymonline.com/index.php?search=history। আহৰণ কৰা হৈছে: 2010-05-16. ↑ 11.0 11.1 Ferrater-Mora, José. Diccionario de Filosofia. Barcelona: Editorial Ariel, 1994. Nash l, Gary B. (2000). "The "Convergence" Paradigm in Studying Early American History in Schools". In Peter N. Stearns, Peters Seixas, Sam Wineburg (eds.). Knowing Teaching and Learning History, National and International Perspectives. প্ৰকাশক New York & London: New York University Press. পৃষ্ঠা. 102–115. ISBN 0-8147-8141-1.